An expandable boat has made its way from the Louisiana here to the coastal bend and it is quite a piece of machinery. 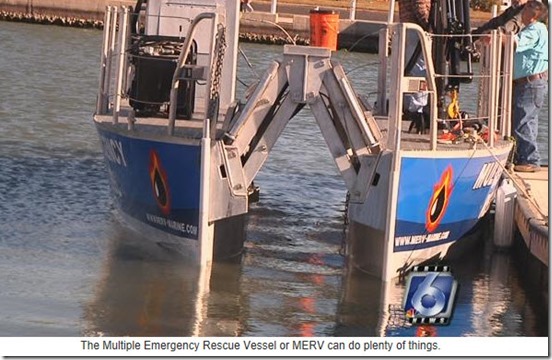 It's a 'Multiple Emergency Rescue Vessel or "M.E.R.V." it can do plenty but as project officials like Bob Putt say, it's main use here, is to clean up our coastal waters. The "M.E.R.V." will now call the bay here in the sparkling city, home. Putt and his team from "MERV Marine, U.S.A", a company based in Louisiana dropped it off and showed off how it's going to play a part in our community. "This boat specifically for this area will pick up trash or anything that's in the water," Putt said. He says, modules or pieces like this, are interchanged on this catamaran which seen here stretches 10 feet across but it can get wider. "The boat has swing arms on it on the front and the back operated with hydraulics and it'll open up to 14 feet," he added. He says, the extension allows the vessel to do so much more beyond collecting baskets of garbage. "It can operate as an emergency and rescue, it has ramps that you can drive a pick up truck on the back for transport, the pump will operate a hose which can help fight fires that are either on board, out in the sea or also onshore," Putt said. After five years in the making, the "M.E.R.V." can also ease an oil spill disaster with the oil scrubber piece that fits between the boat. "We hook up the hoses and it goes into the holes and again you've got 600 gallons on each side, so it can fill up 12-hundred gallons of oil from an oil spill in less than like 7 minutes," Putt said. Thanks to local marina officials and city departments, grants and funds are being raised to pay for the roughly 600-thousand dollar proto-type, that will help beautify our waters for years to come. A demo will be held at the marina to show off the boat's capabilities. If you'd like to check it out, just head down to the Coopers Alley T-heads, it begins at 1:30 Friday afternoon.